Serves 8 This quinoa side dish has all of the flavors of charoset, the mixture of apples, wine, and nuts that is a traditional part of the Seder plate (see “An Orange on the Seder Plate,” page 165). It’s especially perfect for Passover since it doesn’t include anything leavened. I also love it because you can serve it at room temperature, which means you can absolutely make it in advance. Rinse the quinoa thoroughly in a fine-mesh sieve (this may sound like an annoying step, but don’t skip it; quinoa has a natural coating that tastes soapy). 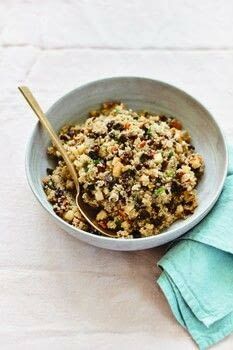 Put the rinsed quinoa into a medium saucepan with 3½ cups [840 ml] water and 2 tsp salt. Bring to a boil, then lower the heat, cover, and simmer until the quinoa has absorbed all of the water, softened, and each grain has “spiraled,” about 12 minutes.